He told me “Never say ‘never. '” Of course, at the time I missed the humor in that contradictory command. But, still, there is wisdom there. Whenever I counsel couples or anyone having challenges in their relationships (aren’t we all? ), I tell them “Avoid the words ‘always’ and ‘never. '” And that’s because those statements are “usually” untrue, and relationships never get healed in the middle of falsehood. But there are times when words like “all” and “none” are actually true and accurate. And it’s in those times we humans, who are more comfortable with “gray” than “black and white,” need to pay close attention because we are being given an insight into foundational truths! Ready? BRETHREN, God has put all things under his son’s feet and has made him the head over all things for the church, which is his body, the fulness of him who fills all in all. And you he made alive, when you were dead through the trespasses and sins in which you once walked, following the course of this world, following the prince of the power of the air, the spirit that is now at work in the sons of disobedience. Among these we all once lived in the passions of our flesh, following the desires of body and mind, and so we were by nature children of wrath, like the rest of mankind. St. Paul grabs the attention of the Ephesians, and us, by listing some amazing realities that MUST shape how we look at our everyday lives. Next, Paul tells us that God (the Father) has placed Christ OVER “all” things for the Church, His Body. And then Paul calls the Church “the fullness” of Him Who fills all in all. Whoah? Really? This is big language meant to arrest us in our routine to stop and consider the implications of such cosmic talk. The Church, made up of those who are Eucharistically connected to the Head of the Church, is Christ’s “fullness.” The Church completes and continues the physical Presence of Jesus in His Creation. And Jesus is the “head” of the Church. By the way, you can never just have a relationship with Jesus and ignore the Church. It’s a package deal! Finally, St. Paul tells us that Jesus has set us free from the former spiritual prison of our undisciplined passions. And this freedom has been given to us through our Eucharistic connection and incorporation into His Body, the Church. It is precisely by being connected and staying connected that we are joined to everything Christ is: All things are UNDER His Feet AND He is OVER everything for His Church. By this actual and faithful connection we escape the natural consequences of being DISCONNECTED from Him Who IS life. Now the question is, as it “always” is, are you connected to His Body, the Church? Every time someone asks me “Is this group in the Church?” or “Is that group in the Church?” I respond the same way “I’m in sales, not management.” And while that answer may be trite and silly, it does help me remember to be humble about this gift of God, His grace to be connected to Him. But it also demands that each of us to learn the tell tale “marks” of that Eucharistic connection with Christ. Only then will this leave theory and start creating a peaceful and sober and faithful life with Christ Who is OVER “all things” and has “everything” UNDER His feet. Today, are you “in Christ?” To be sure, everyone who is baptized in Christ has “put on Christ,” but does your life reflect that reality? Waiting for you in His Church is all the wisdom you need to translate this Truth into actual everyday living. And it starts when you determine to become Orthodox on Purpose! P.S. 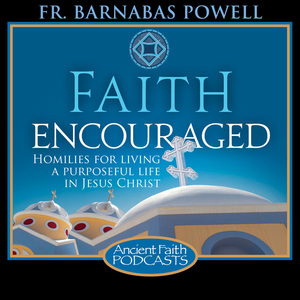 Did you hear last night’s “Faith Encouraged LIVE?” We talked about how to make your parish a Welcoming place for guest! 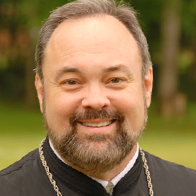 My friend and brother priest, Fr. 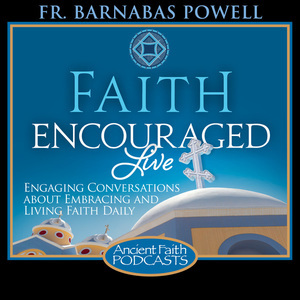 Jonathan Ivanoff of Orthodox Natural Church Development was my special guest. 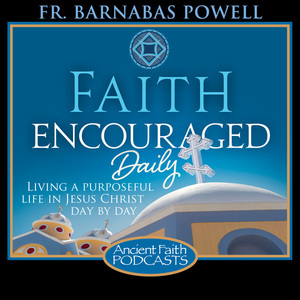 Just go to AncientFaith.com and listen to the archived program. And then share it with your parish priest and parish council! Thank YOU for An Amazing Launch!